On Friday afternoon when I looked out onto Grant Park from my office window, an anxiety started brewing inside of me. 250,000 schmucks were descending upon my city from the bowels of the universe and I was going to have to deal with them. Couple that with my superiority complex, having been to nearly every Lollapalooza since 1991, I feel I deserve some sort of badge, or honor, that has yet to be granted - my emotions were running amuck as I watched the crowd roll in. 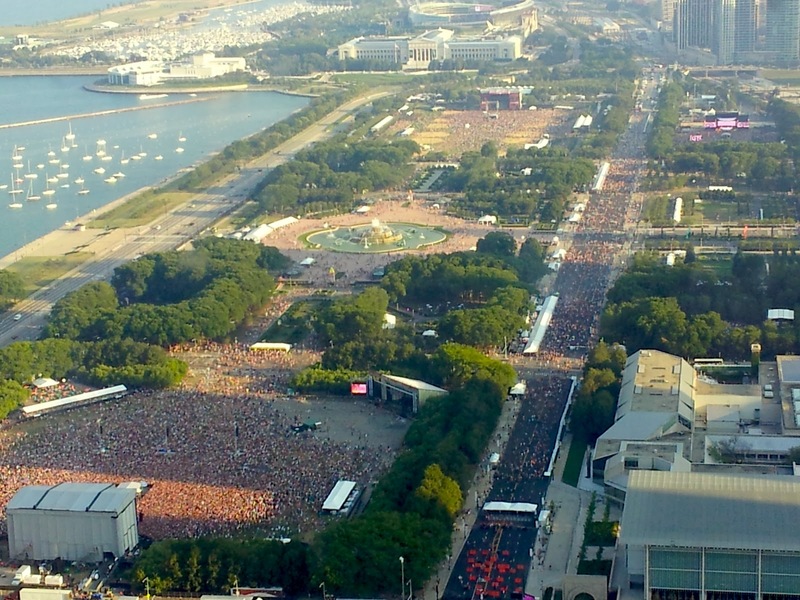 Of my friends, only a handful still attend Lollapalooza. My friend Adam is a die-hard attendee, he and I usually meet up at Lollapalooza for lunch and see a show or two together, we've been friends since were 14, so one can barely count how many concerts we've seen together at this point. I sent Adam a text when I woke up on Saturday, he said he'd be heading to Grant Park around 3pm. Sent a few more texts, and 3PM was about when everyone was arriving. I got ready, head out the door to the ATM and that is when my phone started to blow up... "WHERE ARE YOU? STAY AWAY FROM THE PARK, THEY ARE EVACUATING". I never even made it down there until about 7PM. It really sucked, I was hoping for an all-day experience! When I arrived, I was ready for a Bud Light Lime. I actually do enjoy the refreshing lime taste in my Bud Light, so I ordered one Bud Light Lime and one regular Bud Light. But how was I to carry these beers AND take my pics all at the same time? I only have 2 hands (and 2 beers, and 2 phones). Luckily, when it comes to alcohol consumption, I am quite innovative. I went into Macgyver mode and quickly attached these free recyclable things together and shoved my beers into them. 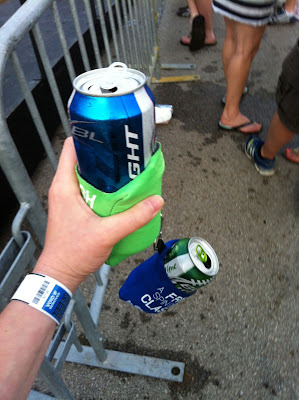 One beer hung from the other, it was pure genius! It was now 7:30, time for Franz Ferdinand. I headed to the Bud Light stage to catch up with Mike Knox and Mitzi, of course, I never found them. However, I did manage to inch my way up closer to the stage by sneaking behind two young girls who were pushing their way up. Unbeknownst to them, I pretended like one was my little sister and that I feared for her safety. She couldn't hear me from the music and the people who I shoved out of my way, well, I think they felt sorry for me having to take care of such a troublesome brat. Franz Ferdinand put on a delightful show. The songs sounded just like their song and the crowd seemed pleased, and I was pleased that they were pleased. I do happen to be a Franz Ferdinand fan (they credit Duran Duran as an influence on their music, so of course I am going to like them), but if you haven't noticed, I'm not a music writer - I write about the experience. And more particularly, MY experience, so you won't be getting any insightful reviews from me regarding the music. The show was ending and I had places to go, other bands to see, so I walked back through the crowd and videotaped some kids dancing in the mud. I found this quite entertaining because they were just dancing around in circles, for no apparent reason at all. You should really watch until the end because this young, red headed lad comes dancing onto the screen and it is slightly amusing. It made me chuckle. Please excuse the fact that I don't know how to take video with my phone. Stay tuned... I have more updates from Day 2 on the way! Or, you can read OLD Lollapalooza stuff here. It rained that year too... but we did puss out, we wore ponchos, drank Bud Light lime and danced. I promise, I am in NO way compensated by Bud Light Lime. I know, it is hard to believe that someone actually enjoys it, but I am that someone. I like Bud Light Lime.